Like its predecessor, the Vela, the Advanced Vela series of spacecraft were designed to monitor worldwide compliance with the 1963 nuclear test ban treaty. The Advanced series added atmospheric nuclear detonation detection to its capabilities. Additionally, it monitored solar activity (providing radiation warnings for manned missions), terrestrial lightning activity and celestial X/gamma-ray radiation. All six spacecraft operated for more than 10 years. Their nuclear detection role was assumed by IMEWS in the 1970s. Touted as the longest continuously operating space system in 1985 when USAF shut down the last 3 spacecraft. 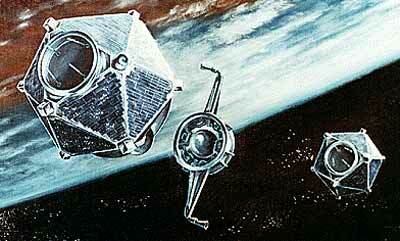 The spacecraft featured the first dual-spin, zero momentum attitude control system. In launch configuration, two 26-sided polyhedron spacecraft were connected by a central cylinder containing an apogee motor. Body mounted solar cells generated 120 Watts. Total payload mass was 63 kg. Two optical bhangmeters observing Earth. Twelve external X-ray detectors and 18 internal neutron and gamma-ray detectors.